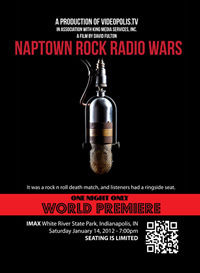 It is with great pleasure that we announce the World Premiere of “Naptown Rock Radio Wars” on Saturday, January 14, 7pm at the IMAX Theater at White River State Park in Indianapolis. There is only a single showing scheduled, so don’t miss this rare opportunity! Seating is limited and there will be a special VIP option for a select few. Stay tuned for details! There seems to be a differance as to when the tickets will be going on sale ! December 19 is what is listed here and what I had marked on my calander .. but I heard today that it has been moved up to Dec. 9th … which is right ??? What to make sure I purchase my tickets as soon as they become avalible !! Thanks ………….. had bad e-mail address on first post !!!! Dale, Tickets go on sale Monday, December 19 at 10am via the IMAX theater. Seating will be limited so buying the tix early is probably a good idea. We’ll post a link as the time approaches, or you can purchase them at the box office. Looking forward to seeing you for the premiere. The announcement says both “premier” and “only a single showing scheduled.” A premier implies that there will be more showings somewhere at some time. Single showing implies one time only. Which is it? Thank you. I am so honored to have been invited to participate in this amazing film. The film makers traveled across America to gather factual information about one of the most fascinating “battles” in rock history. The titans have surrendered their weapons, but the battle won’t be settled until the showing of this film. …and maybe not even then. I’m hoping to attend. It would be wonderful to re-visit our Indianapolis listeners. Will there be more dates other than the premiere night Jan 14, or is this a one-time showing? what other dates and times? maybe a quick link to those? seems like you might want it playing a few times during the SuperBowl. This looks great and would not miss it! Thanks to Dave Fulton for allowing a sneak peak of Naptown Rock Radio Wars. This is the definitive history of Top 40/Rock and Roll radio in Indianapolis from the beginning of the format on WIBC, the huge changes after WISH was sold to become WIFE, to the end of of WIFE and the changes in Naptown radio toward the end of WNAP. The history of rock radio in Naptown is described by those who made it. This is a must see for not only radio aficionados but for those who want to know how uniquely Indy in the 50s, 60s, and 70 was served by radio. General Admission tickets for the 7pm premiere showing are now SOLD OUT. VIP Packages are still available. IMAX has agreed to add a second showing at 10pm this Saturday. Tickets are on sale now. There are no VIP packages for the 10pm show. Is this film available for purchase? I grew up in Indianapolis in the 60s and 70s and listened to both WIFE and WNAP every day. I live out of state now and this is the first I’ve heard of the documentary. New Showings of Naptown Rock Radio Wars!